Blog | UU Climate Action Network | Sharing Unitarian Universalist climate action and justice news! The Commit2Respond is an effort of a coalition of Unitarian Universalists and other people of faith and conscience working for climate justice. Commit2Respond was launched at the People’s Climate March in New York City in September 2014. Climate Justice Month from World Water Day through Earth Day, March 22 – April 22, 2015. The Grounded & Resilient Organizers’ Workshop (GROW) climate justice training this Summer. Commit2Respond’s grounding in climate justice means we recognize the central role inequality plays in the current crisis. We envision a future where the most vulnerable are protected from these heart-breaking consequences. Find out more about Commit2Respond, and connect on Facebook and Twitter. Join the movement at commit2respond.org and sign up for Climate Justice Month! 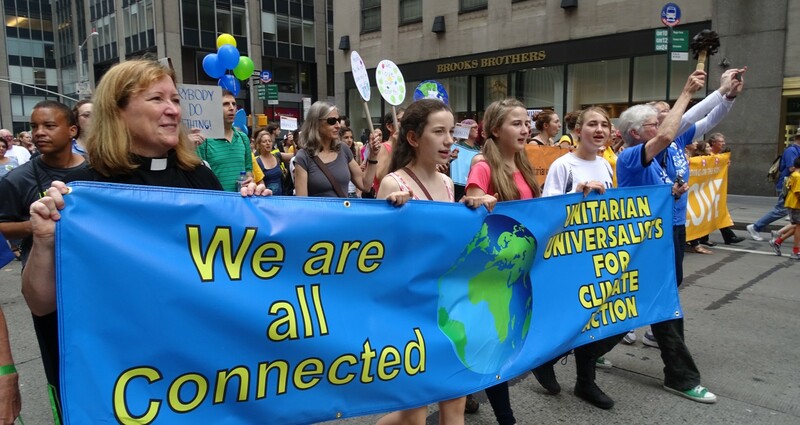 Among the 310,000 participating in the People’s Climate March on September 21, 2014 was a huge faith contingent including thousands of Unitarian Universalists. Together with people of all faith traditions — Christians, Quakers, Humanists, Jews, Muslims, Buddhists, Pagans, my fellow Unitarian Universalists, and others — marched to bring attention to global warming as a moral issue and to issue a call for climate justice. Below is a collection of media from the march including photos of Unitarian Universalists, videos and other coverage. Find yourself in the March! The following video has footage of the People’s Climate March Faith Contingent. Can you find yourself in the crowd? You can sign up for updates and share your ideas at Commit2respond.org. This weekend Unitarian Universalists from across the country are joining in the People’s Climate March! The Rev. Kate Lore (video below) rode the Climate Train across the country to NYC and has been live tweeting. Checkout her Peoples Climate tweets here. You can follow coverage of UU’s at the march on Twitter following the hashtag #Commit2Respond and looking for tweets & retweets from the @UUClimateAction account. This weekend the new UU climate campaign “Commit2Respond” is also being launched. This campaign is an initiative of the Unitarian Universalist Association, the Unitarian Universalist Service Committee, the Unitarian Universalist College of Social Justice, the Unitarian Universalist Ministers Association, and Unitarian Universalist Ministry for Earth! Learn more and signup for updates at http://commit2respond.org. I will be at the march helping to document UU participation. If you’re going to the march, look for me Sunday morning in the Faith Contingent Staging Area where I’ll be interviewing UUs about climate justice. Want to learn more about what’s happening with Unitarian Universalists at the march? Check out our Meetup page for the march. Here’s a video Rev. Lore shared on her way to NYC. The following episode of the VUU talks about the UUs and the march. 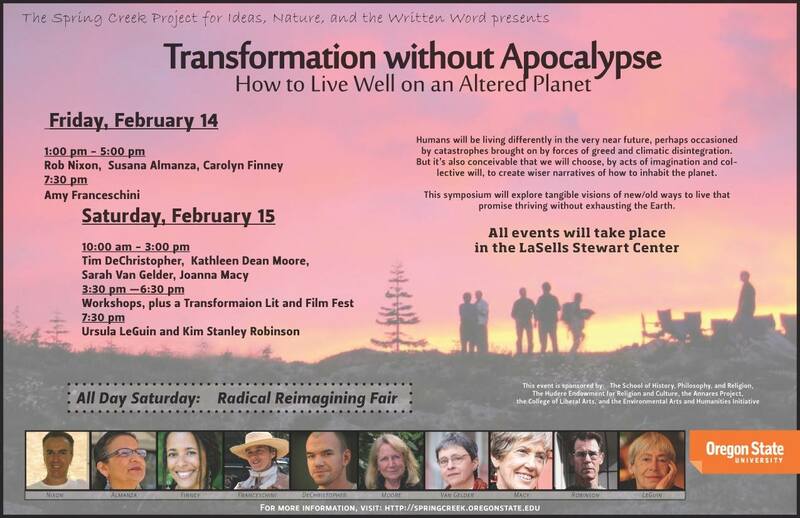 Event announcement via Claudia Keith, member of the UUFC Climate Justice Steering Committee. The proposed Business Resolution on Unitarian Universalist Association (UUA) Divestment for General Assembly 2014 is now posted on the Unitarian Universalists for Fossil Fuel Divestment and Sustainable Reinvestment website. Soon a signature gathering process will begin. The minimum petition requirement is 250 signatures from at least 25 congregations certified by UUA in 2013 with only up to 10 signatures per congregation counting toward the required total. Is your congregation doing collaborative work on environmental justice? If so, the following notice details an amazing funding opportunity from the EPA’s Environmental Justice Collaborative Problem-Solving Cooperative Agreements Program. This announcement comes as a referral from UUA Green Sanctuary Program manager, the Rev. Karen Brammer. The Office of Environmental Justice has released the Request for Application for the Environmental Justice Collaborative Problem-Solving Cooperative Agreement. The Environmental Justice Collaborative Problem-Solving (CPS) Cooperative Agreement Program provides funding for eligible applicants for projects that address local environmental and public health issues within an affected community. The CPS Program is designed to help communities understand and address exposure to multiple environmental harms and risks. The CPS Program requires selected applicants, or recipients, to use the EPA EJ CPS cooperative agreement as part of their projects. The model aims to address local environmental and/or public health issues in a collaborative manner with various stakeholders such as communities, industry, academic institutions, and others. The total estimated available funding for awards under this competitive opportunity is $1,200,000. EPA anticipates awarding one cooperative agreement per EPA region in amounts of up to $120,000 per award for two years. The Office of Environmental Justice is holding six pre-application assistance calls. One of the six calls will be conducted in Spanish. Below is a list of dates and times for each call. You can find information about these calls on page 21 of the RFA. To call in, please use the following number and passcode: 1-866-299-3188 and entering the code 202-564-1771 when prompted. The Rev. Fred Small speaks at the November 15th, 2013 “Climate Solutions: Pathways to Action” event held at First Parish in Concord, MA. The event was co-sponsored by ConcordCAN!, the League of Women Voters of Concord-Carlisle, the Social Action Community at First Parish in Concord, Trinitarian Congregational Church, Trinity Episcopal Church, and Musketaquid Arts and Environment. Malcolm Bliss, the statewide coordinator for 350MA. Mark Sentesy, 350MA Engaging Government Coordinator working on the Deval Patrick Climate Legacy Campaign. Rev. Fred Small, the Senior Minister of First Parish in Cambridge and Co-Chair of Religious Witness for the Earth.” Singer-Songwriter-Song Leader. The Unitarian Universalist Association is one of a growing number of investors with concerns over “unburnable” fossil fuel reserves and investment in new fossil fuel projects. The UUA was one of the organizations raising concerns in this September 9th, 2013 letter. Read the full story on Inside Climate News: Wall Street Demands Answers From Fossil Fuel Producers on ‘Unburnable’ Carbon. For official UUA news please see the UUA Press Room. The following is the press release via Darcy DuMont on Unitarian Universalist Society of Amherst’s vote to divest. Read Full Resolution (PDF). At a congregational meeting on Sunday October 20, members of the Unitarian Universalist Society of Amherst (UUSA) voted unanimously that the Society divest of all fossil fuel funds over the next five yeas. They voted also to urge the national organization, the Unitarian Universalist Association, to divest; and they voted to support divestment efforts in the wider community, including the Town of Amherst and Commonwealth of Massachusetts. The UUSA has acted on it’s commitment to green values over the years including receiving Green Sanctuary Certification, having an active Green Sanctuary Committee, sponsoring an annual Connecticut River clean up, ensuring that the meetinghouse is energy efficient, including planning to install solar panels on the new addition, encouraging the purchase of local food, overseeing a voluntary individual carbon tax program for members, and by various other programs to reduce their carbon footprint. With this vote the UUSA joins a growing number of churches, colleges, towns and states across the country, which are bringing pressure to bear on government and industry to act now to slow climate change. The Unitarian Universalist General Assembly in 2013 unanimously passed the “2013 Act Of Immediate Witness to Consider Divestment from the Fossil Fuel Industry”, which asked congregations to consider divesting their funds from the fossil fuel industry. A resolution to divest the national UUA endowment will be voted on at the 2014 General Assembly. The UUSA resolution supports the petition of Alice Swift et al. to the Town of Amherst, to adopt a policy not to invest in fossil fuel companies, which Town Meeting will consider in November. The resolution also supports pending state legislation, S. 1225, which would divest the state pension fund of fossil fuel investments. The bill is sponsored by Senator Ben Downing and would divest the fund of fossil fuel companies gradually, 20% per year, over a period of 5 years.